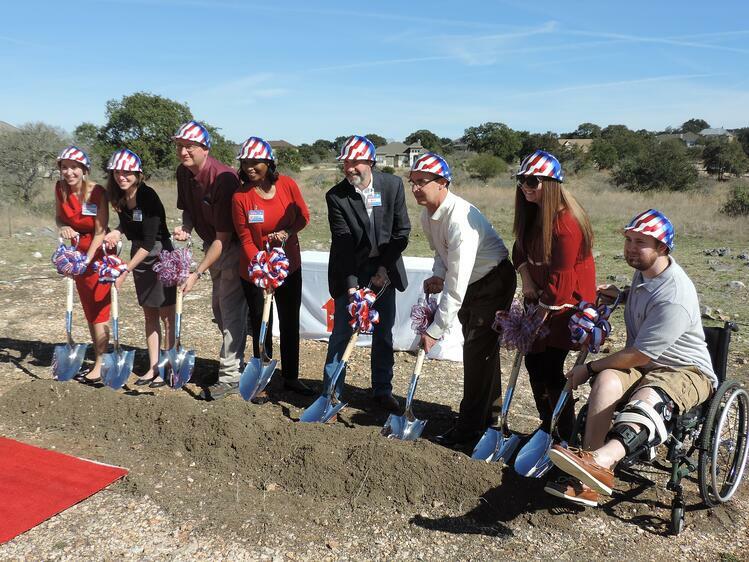 (January 29, 2015—NEW BRAUNFELS) SouthStar Communities, Operation FINALLY HOME and HEB broke ground today on a one-of-a-kind, custom-built, mortgage-free Smart Home for U.S. Army Specialist Michael Crawford in the developer’s Vintage Oaks neighborhood. The 23-year-old veteran was wounded in 2011 while serving in Afghanistan when an improvised explosive device (IED) struck the truck he was in during combat. Crawford’s injuries left him paralyzed completely in his right leg and with minimal movement in his left leg. Crawford received a Purple Heart and a Bronze Star for his service but has difficulty with everyday tasks such as washing dishes and opening cupboards and his current apartment is not ADA accessible. Now, he’ll not only have a home to call his own but it will be ultra-accessible and barrier-free with automated kitchen cabinets and closet systems, a custom clothing lift and a variety of smart appliances specialized for those in wheelchairs. He’ll also have a robotic vacuum and lawnmower and mechanical mop designed by robotics specialists at the University of Texas at Arlington Research Institute. "I don’t know where to begin other than thank you,” said Specialist Crawford. “Someone out there is more in need of a home than me. That's how I feel about it. It's definitely humbling to know that you were the picked candidate. It's the gift that you can never ask for but once you get it, you're just so grateful." SouthStar Communities provided a one-acre home site in Vintage Oaks and this is the 11th home they have worked on with Operation FINALLY HOME since its inception in 2005. With its close proximity to military hospitals and bases in San Antonio, Vintage Oaks is the fastest growing community in the Hill Country and has become one of the coveted neighborhoods in the state for veterans. The community is one of the largest contributors to Veteran Land Board loans in Texas. Its veteran population is growing each year and Vintage Oaks recently announced a new Memorial Park, which will feature a pathway of engraved stones honoring neighborhood veterans and their families. As part of the groundbreaking ceremony, SouthStar presented Specialist Crawford with the first personalized stone for the new Veteran’s Memorial Path in Vintage Oaks. Operation FINALLY HOME was founded in 2005 as a non-partisan/non-profit organization with the mission to provide Americans the ability to honor and thank America’s wounded and disabled veterans and the widows of the fallen who have sacrificed to defend our country in the global War on Terror. Operation FINALLY HOME addresses the most pressing need of our returning heroes -- a home to call their own. The organization’s reach has expanded well beyond Texas, and includes projects in New York, Kansas, North Carolina, and Tennessee. In 2010, founder Dan Wallrath was named one of the year’s CNN Top 10 Heroes in honor of the program’s efforts. More information can be found at Operationfinallyhome.org.